A few years back, an American friend introduced me to the joys of Oregon Trail, a rudimentary video game from the 1970s in which your mission is to navigate a band of pioneers across the treacherous West. Without warning, one of your party could fall ill and drop dead from a range of ghastly, horribly realistic ailments including dysentery, cholera or even a broken leg. A gorehound hack in the vein of Eli Roth could have had a gay old time recreating the exploding pustules and festering sores in living colour but thankfully Meek’s Cutoff – essentially the film adaptation of the game – is the product of one of the most considered, restrained directors working today: Wendy & Lucy’s Kelly Reichardt. 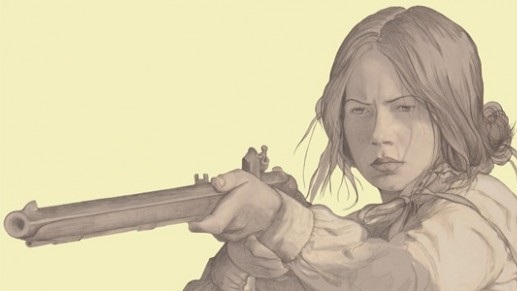 Her film is a glacier-paced Western in which a disparate group of settlers travelling through the Oregon desert in 1845 find themselves stranded in unforgiving conditions. Their guide, the titular Meek (played by a barely recognizable, wildly-bearded Bruce Greenwood) is a vain, agressive blowhard, who may or may not know where he is leading them. As they tramp across the terrain, tensions fray, suspicions develop, exhaustion sets in and the drama intensifies with the introduction of a captured Indian tribesman who may be their only route to safety. Suffice it to say, we are not in thrill-a-minute territory here. Reichardt is interested in presenting the journey in all its boredom and frustration, and key to her modus operandi is the careful building of atmosphere through a precision-controlled technique; a long static shot of the wanderers followed immediately – disorientingly – by another one; a limited, earthy palette, ghostly campfire scenes (with no baked beans in sight) all augmented by a plangent, eerie score. The drama comes from the growing sense of unease within the group, and I found it highly reminiscent of the second half of Walter Hill’s exceptional and bizarrely underrated thriller 1981 Southern Comfort (better than Deliverance – there, I said it), in which a decimated group of National Guardsmen tentatively make their way through Cajun backwoods territory; neither native nor nature is looking out for them. One of the truly refreshing qualities of Meek’s Cutoff is the absolute straightness with which it is played. In an age of post-post-modern revisionism (I’m looking at you Joel and Ethan) it is fascinating to see such hardships evoked so earnestly and without so much as a nod or a wink. The rub is that this austerity doesn’t preclude humour; one scene, in which Reichardt’s static camera observes Michelle Williams taking an eternity to load a gun, parp off a pathetic warning shot, and then do it all again in real time, is a masterpiece of deadpan absurdity rooted in the realities of a desperate situation. In another moving sequence toward the film’s conclusion, a pair of exhausted characters share a hysterical laughing fit – the kind that happens when you’re so tired there’s nothing else for it. Generally, the performances are strong. Will Patton, a classic “I know the face… what else has he been in?” actor is great as the rugged, forward-thinking Soloman Tetherow, and the ever-dependable Shirley Henderson is high-pitched and haunting as the pregnant, meek (EDITOR! Oh, I am the editor) Glory White. And Michelle Williams, of course, continues to demonstrate just how many miles better than the likes of Dawson, Pacey and Joey she always has been with her portrayal of Tetherow’s young wife Emily. Despite its myriad strengths, Meek’s Cutoff is by no means perfect. As a by-product of its all-consuming vagueness, some of the characterization is ill-defined to say the least. It was difficult (for this reviewer, anyway) to discern that Dano and his hysterical partner were actually a separate family rather than a brother and sister. Furthermore, Dano, genuinely impressive in another Pioneer-piece (PTA’s There Will Be Blood), seems all at sea here, a boy miscast in a man’s role. He’s also sporting a maddeningly irritating wispy beard. It is far from a bold statement to say that Meek’s Cutoff won’t be for everyone, not least those who require actual things to happen at regular intervals in their films. To enjoy it is to surrender to its singular style. Absorbing, thoughtful and atmospheric, it is highly recommended. Oh, and those complaining about the ambiguous ending are missing the point – it’s academic. We all know how this story really ended. The fate of the Native American Indian and the end product of Westward expansion is well documented. 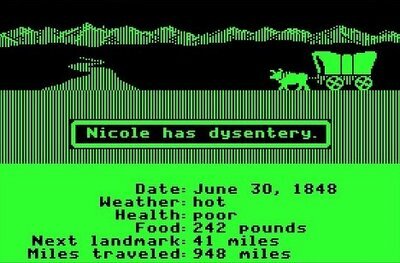 And Ashley has died of dysentery. This entry was posted in Reviews and tagged film, Justin Bieber, Kelly Reichardt, Meek's Cutoff, Oregon Trail, western on May 5, 2011 by Ashley Clark. 1) That screenshot – uncanny! Who knew? I also agree that this film’s strength lies in its “absolute straightness” – a kind of quiet obduracy (mirrored, one might say, by the pioneers it depicts. Mmm.) We’re in an age of post-post modernism, yes – and also an age when every film seems to know its audience, or which demographic it’s aiming to please. Reichardt, on the other hand, seems only to want to tell her story, at her own pace and in her own uncompromising way. That’s satisfying to watch, even if/when there are flaws.